NAMM 2018: Japanese giant Roland has announced the release of two highly-desirable pieces of hybrid drum kit. 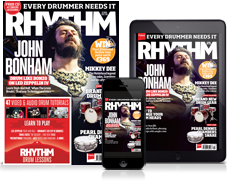 The TM-6, capably demoed in the video above, is a pro-level hybrid drumming unit that coms out of the box with 500 sampled sounds, including many newly recorded at world-famous studios, plus 268 of Roland's now-familiar V-Drums sounds, 80 ready-to-use kits, and inputs for connecting up to 12 pads and/or drum triggers. Plus, you can of course import your own samples. From the TM-6 PRO’s panel, players can assign, mix, and modify sounds, apply built-in effects, monitor trigger status, and more. It’s also possible to play backing tracks directly from SD media, and use the TM-6 PRO as a USB audio interface and trigger-to-MIDI converter for a computer DAW. The TM-6 PRO features six dual-trigger inputs that can accommodate up to 12 total trigger devices when using Y cables. Available Roland devices include V-Pads, RT-series acoustic drum triggers, the BT-1 Bar Trigger Pad, and more. There’s also a hi-hat control input for connecting an FD-8 hi-hat pedal as well as four assignable audio outputs, a click track and headphones monitoring. At the moment, launch date and price are TBC - for more info, visit Roland.com.